I love Krispy Kreme! Yum! One beautiful noon day I decided to give myself a day out with a pampering full body spa at Urban escape then went to Krispy Kreme to eat a light snack. I love Krispy Kreme doughnuts but I do not like eating too much sweets so I order something different with not so sweet taste I think. It was a Mango Kruffin and brewed coffee that I ordered. The taste is so perfect with my taste bud. The Mango Kruffin is not so sweet and so heavenly yummy 🙂 . It is an American-style handmade muffins filled with deliciously ripe Mango that is also perfect this summer season. On my next drop at Krispy Kreme, I plan to buy their Ham and Cheese Pull Apart baked creations which looks so delicious too. I can’t wait for weekend. I am craving now to try out Ham and Cheese :). 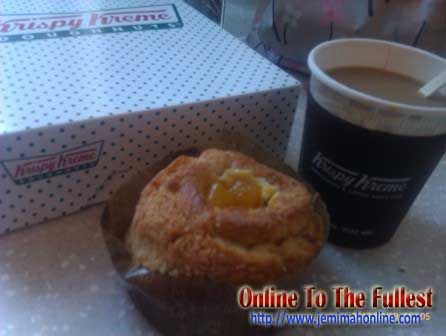 This entry was posted in Foodies and tagged Krispy Kreme delicious muffin, Krispy Kreme Mango Kruffin and brewed coffee. Bookmark the permalink.